Take a look at all of the awesome Star Wars Gifts for the Bride and Groom. If you are not sure where to even begin to find Star Wars Wedding Gifts, look no further. I personally have a hard time finding just the right gift, but this collection of Star Wars wedding gifts has something for everyone and more. Handmade, eco-friendly and features Yoda. They Will Love It! 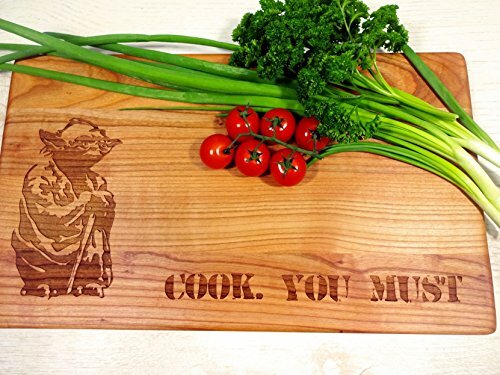 This high quality cutting board will enthrall a couple that loves Star Wars unique gifts. It’s not everyday that Yoda can join along in the kitchen for dinner prep. 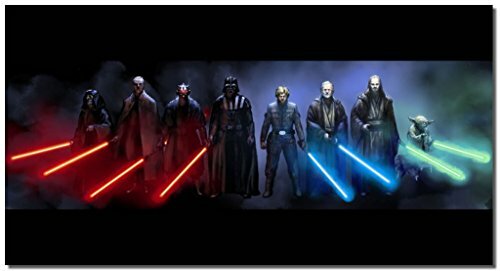 The coolest thing is that there are many more Star Wars Cutting boards to choose from! These have to rank as the cutest Star Wars wedding gift items on the planet (no pun, hehe). Plus they make a nice addition to a larger wedding gift as a “little something else”. I could see these sweet gems being quite the conversation piece when couples entertain. I can’t decide which set I like the best. How about you? Star Wars Salt and Pepper Shakers – R2D2 and R2Q5 – Add a little Star Wars to every Meal Star Wars Lightsaber Salt and Pepper Shakers Star Wars: The Last Jedi BB-8 Ceramic Salt and Pepper Shakers – Stackable 2 Piece Set Funko POP Home: Star Wars – Vader and Stormtrooper Salt N’ Pepper Shakers Star Wars Ceramic Salt and Pepper Shakers – Darth Vader & Stormtrooper – Take your Meals to the Darkside! Most couples have a waffle maker on their gift registry. And if they also like Star Wars, this can be the perfect gift and also the most fun gift. A new waffle maker + Death Star makes an awesome Star Wars Wedding gift. The bride and groom Star Wars fans will love making giant Death Star waffles for breakfast or anytime. Do you think the bride and groom would prefer a Stormtrooper Waffle Maker? Star Wars wedding gifts for the dedicated couple that collects the best Star Wars specialty items. Fun glassware that is not only collectible but for everyday use. Lighting and lamps are my favorite ways to decorate and this Clone Trooper Lamp is outstanding. 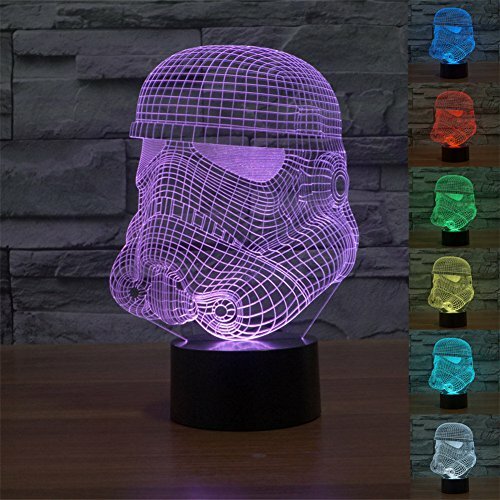 I love this Star Wars wedding gift because there are tons of ways a new couple can use this colorful lamp. Where would they display it? There are so many places to enjoy this lamp! I am thinking bedroom, office, family room, game room, foyer and kitchen. It also makes a great night light for any room. I love the colors too, seven in all and the settings are so nice. One setting shows all seven colors gradually changing from one to the next. The other setting allows you to pick one specific color. I think this is especially nice for holidays when a specific color will fit in with holiday decor. An awesome lamp and I wouldn’t be surprised if a wedding couple wanted more than one! A Star Wars Wedding Gift with a WOW Factor…. Canvas Art that is Fabulous, but not over done. This Star Wars gift item is a wonderful choice and will help the new bride and groom with decorating. Most of the prints I have come across need to be framed, but this one is stretched on canvas. What I love about this set of canvas art is that it arrives ready to hang. How nice for a couple to enjoy a gift of art without the extra cost and framing hassle. Great to have on hand for guests and anytime on cool nights. Chances are the wedding couple could use a few blankets or throws to keep them warm on chilly nights. This is an item that is sometimes overlooked for a wedding gift, but a great idea and certainly an appreciated gift that is both practical and fun to use. There are quite a few here to choose from and all will be nice for snuggling. One of the coolest Star Wars Wedding Gifts ever! A unique gift for the Star Wars fan couple, featuring an unforgettable scene with a frozen Han Solo. 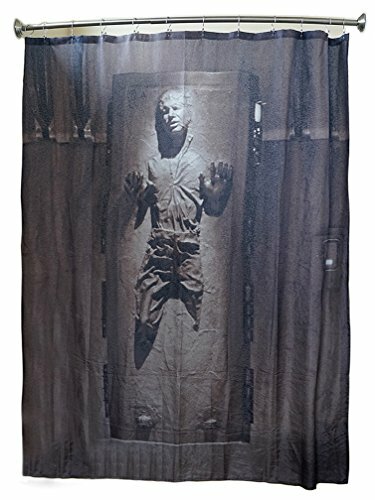 This shower curtain will fit with any decor and especially Star Wars bathroom decor. The colors are subtle in grays and browns which makes this a nice neutral addition to a bathroom without commanding attention. Another nice feature…..shower hooks are included! 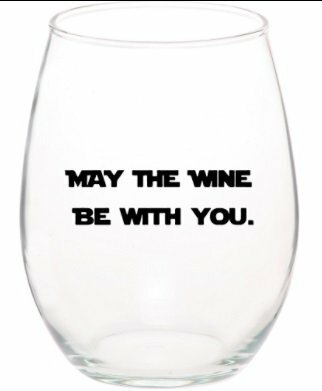 Best ever wine glasses for true Star Wars fans! A great gift for the bride and groom that enjoys a sharing a bottle of wine together. Pair up these glasses with a special bottle and you have a weeding gift ready to deliver. I have a confession! The last Stars Wars movie is the ONLY Star Wars movie I’ve seen. These would make great gifts for Star Wars fans. I find the waffle iron to be especially interesting. I absolutely love the clone Trooper lamp it is super trendy and cool. I also like the piece of multi-panel wall art right below the lamp. It is abstract and super cool looking! Wow, who would have known just last month when you posted this that Carrie Fisher would be gone now, much too soon! That should make any Star Wars products, especially with her character, even more valuable and sentimental now! I think the cutting board and waffle maker would are absolutely awesome! What clever ideas. I wonder if the bride and groom would offer as wedding swag? Maybe stormtrooper S & P shakers would be a neat idea, lol. I love themed gifts and these are some good ones.The spatulas are very cute. I also like the cutting board. My boys love Star Wars and would love most of these items. I like the salt and pepper shakers. Ha now I know where to look when my niece gets married.. or for her birthday, christmas etc.. She is a nut for all things Star Wars! My sister is getting married next year and she and her fiance LOVE Star Wars. Thanks for saving the day! Love these gift ideas. My nephews are so into star wars. Can’t wait to go shopping! I never thought about Star Wars and wedding gifts going together. A true fan would love all of these ideas! I have a friend who would love this stuff. They are a huge fanatic of Star Wars. I would have taken any of this stuff. Star Wars gifts are so much fun! These Star Wars gifts are such great ideas. We have a couple buffs in our family and friends that would love these! 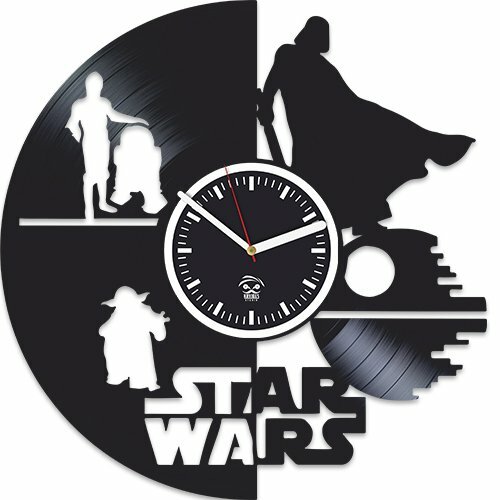 My son is ultimate star war fan, hope I can find this items when he is getting married. By the way it is going to take long time as he is only 6. Totally awesome! Can’t say I would have ever thought of Star Wars products as wedding gifts but I can honestly say I would love the waffle maker! What a fun list! I know some people who would love any one of these gifts. 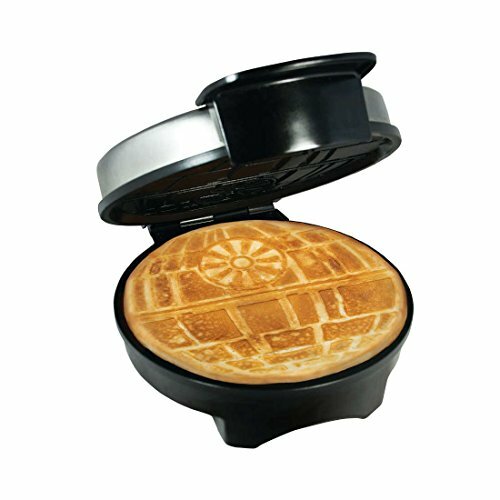 Not going to lie – that Death Star waffle maker is super awesome. I wish I had this list for when we were getting married. I am a huge fan and would have loved my kitchen stocked with gifts like this. Who doesn’t love Star Wars! These sound like some absolutely FANTASTIC gift ideas as well – I might have to treat my OH to some. My brother is a big fan of star wars. The Clone head lamp is so cool perfect gift for Star wars fanatic. These are some killer gift ideas! Star Wars fans get married all the time; perfect ideas! I’m not a Star Wars fan. But that Star Wars waffle maker is surely interesting. Kids would love it. Oh my gosh! These are so much fun! My husband and I both love Star Wars. All those kitchen gadgets need to come home with us. These are some great ideas for Star Wars wedding gifts! They are so creative and look like so much fun! These are such cool ideas. I love those silicone trays and salt and pepper shakers. My friend has them and everytime i see them, I always compliment her how cute they are. These are all so cute! I love the salt and pepper shakers! My son already has the toaster but he would LOVE that waffle maker! SO cool!